Jim Seery Memorial Hammer-In – There is no plan and we are sticking to it! 2019 Dates will be May 30th, 31st, June 1st, and 2nd. The Jim Seery Memorial 30th Annual Hammer-In blacksmith event. 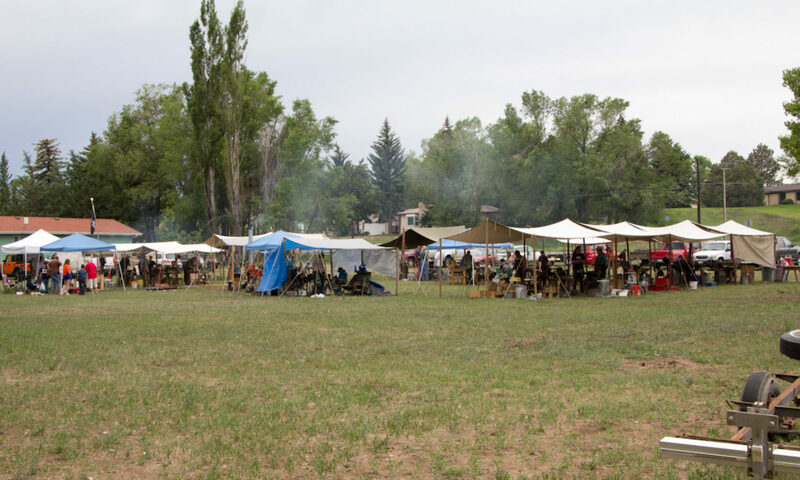 Hammer-In is intended to be an opportunity for people interested in blacksmithing to get together to socialize and share knowledge. The is no formal program, and traditionally we have fastidiously avoided having any coherent plan, which we follow precisely. If you’re getting started, there will be forge setups for you to learn some basic techniques on simple projects, and more advise than you can pack home in a bucket. Some of it actually good. As is tradition and practice, if you don’t know – ASK. If you do know, TEACH. Contrary to all governmental policy, we assume the people who attend are adults, and we have a policy of an absolute minimum of rules. You are responsible for your own safety, and that of anyone with you. Blacksmithing, by definition, involves hot forges and iron, heavy anvils and hammers and the like. If you want safety equipment (safety glasses, gloves, aprons, etc) you will need to provide them for yourself. Young people are welcome, but need to understand that there are hot forges, hot iron and heavy tools in the forge area, and need to behave appropriately. We expect the adults with them to see this is the case. Because of a couple of situations which developed in past years, we do have a couple of minor changes which we feel we must maintain. We prefer that people not bring their dogs, if possible, because the property owner has animals and there is a very busy highway along side the site. If you feel obliged to bring your dogs, they MUST be under PHYSICAL control at all times. This is a rule we WILL enforce this year. The Big Thompson River is along one side of the property as well. We have never had a problem, but we have no control over the river, and we don’t want any accidents. There is some camping space, subject to first come, first served. There is potable water available. Small camp fires are OK, but bring your own wood for them. If you have some sort of overhead “fly” for your forge setup, bring it. We want anyone who wants to come to be able to join us, but there are some expenses involved in putting this event on. There is the mailing list, and a bottle of something nice for our host, Rusty May, and the biggest expense of all, the Porta-Johns. The cost of them is getting steep. We don’t charge a fee to join us, but we do ask everyone who is able to contribute $10 to help us cover the costs associated with putting on a fun event. That’s $10 to cover all four days of the event. Seems a bargain to me. Please understand that none of us who put this event on have EVER made a profit out of it. That is not our intent. But we do need to cover our costs. Jim always said that if the event ever got to be too much trouble, or cost us too much money, it would come to an end. That is still the way we feel. We don’t want or plan to make any money out of this, but we do feel those who participate have a responsibility to contribute their share for the expense of having it. I know that our founder, Jim Seery, will join us in spirit again this year, watching to see that all “S-hooks” are properly made, and that a good time is had by all. We hope you will join us for another fun year. Please feel free to contact us if you have any questions. Jan Manning and Jim Taylor.